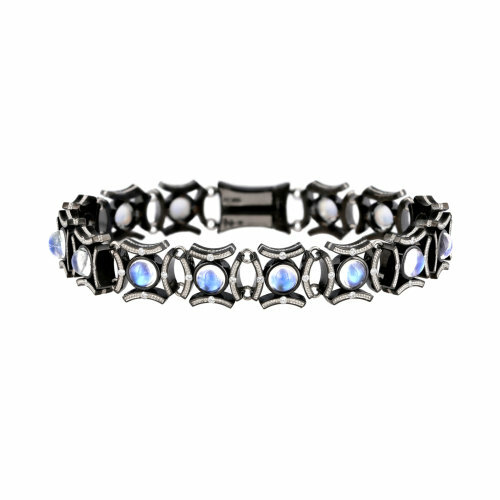 “Moon Temple” – captivating Moonstones draw you in closer to marvel at the detail. This bracelet is made from 115 different parts (not including the gemstones) assembled with Swiss watch perfection. This bracelet is made from 115 different parts (not including the gemstones) assembled with Swiss watch perfection. Fourteen .50 ct. round cabochon Moonstones and ninety-two Diamonds accented by pure Platinum shaped inlay in Knightsteel.